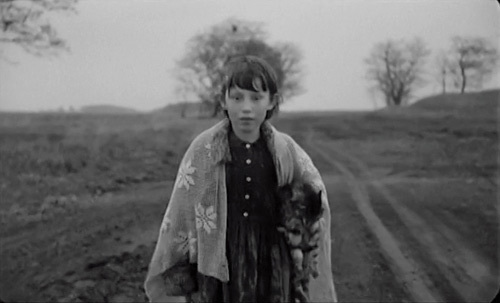 Look at this image from Béla Tarr's film Sátántangó. In one long tracking shot, a girl named Estike played by Erica Bók walks down a dirt road, and the camera tracks backward in front of her. Often we can see what must be — barring an unlikely digital effect or an overly elaborate crane — the freshly made tracks of the camera dolly, clearly visible on the ground behind her. We accept them without question because they make sense within the story: maybe they were made by a cart or by a vehicle that recently travelled down the same road. In other words, a mark made by the machinery of cinema has an internal explanation within the narrative, and it's only when we stop to think about how the film works, technically, that we even notice it. But that's exactly what Béla Tarr's films ask us to do, especially the 7.5-hour Sátántangó. They ask us to stop and think, to meditate on what we're seeing, and he gives us plenty of time to do that with shots of people walking for minutes at a time. Lately I've been interested in films that, intentionally or not, allow the evidence of their production to harmonize with their themes. Such evidence isn't an error but an amplification, a subtle echo, a brush stroke. The first issue of Unspoken Journal appeared today, and it's dedicated to Tarr. I've contributed a rumination on Sátántangó. While Sátántangó is often described as a detailed self-contained world, like all films it shows evidence of the filmmaking process, sometimes unintentionally as in the photographer’s reflection, sometimes playfully like the visible brush strokes of the Impressionists, and sometimes individually in an active viewer’s mind. What is most unusual about Sátántangó is that the film itself seems to mingle with its own themes of external, quasi-spiritual forces. As the characters react to foreign elements, the cinematic machinery breaches the narrative hull, hinting at something outside the film: the filmmaker, viewer, and apparatus of its art. Read more at Unspoken Journal, edited and assembled by Yvette Biró, Edwin Mak and HarryTuttle. The issue is full good stuff.